A free press is never free. And for our independent student newsroom, this is especially true. But now, any member of our community can chip in to help. 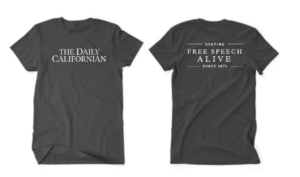 The Daily Californian is launching a new monthly membership program. For the price of a cup of coffee each month, you can support the independent coverage that shapes the face of Berkeley. In just the last year, the Daily Cal’s made an incredible impact. We provide the most complete and accurate coverage of right-wing speaking events on campus. We uncovered documents that proved a sexual harassment epidemic throughout the UC system. Our coverage of numerous citywide and statewide ballot measures, the progressive sweep of Berkeley City Council and the unexpected presidential conclusion was unrivaled. Daily Cal staffers don’t just leave their mark on Berkeley. Many of the nation’s best journalists got their start at the Daily Cal; we are proud to include Pulitzer Prize winners, Emmy recipients and investigative specialists among our alumni. When the Daily Cal became independent from UC Berkeley in 1971, under the proud headline “It’s your newspaper now,” we did it precisely so that we could publish enterprise and investigative work that holds power to account. Since then, generations of students have fought tirelessly to retain our financial and editorial independence. You can join in that fight. Become a member.